I’ve received countless emails asking me how I organize our day, and how I manage to homeschool while teaching multiple students all at different grade levels. So today, I thought I’d share a little bit of how we do things over here…for what it’s worth anyway! First off, I’d like to note that so far each year has been a little different schedule wise due to the ages of our children, and what extra curricular things we are involved in. In previous years, we’ve done school primarily in the afternoons during the Teeny Tot’s naptime, we’ve done it in-between nursing when we’ve had new babies, it’s been done in the kitchen, in the living room, and at the library. I’ve learned to kind of “go with the flow” so to speak which hasn’t exactly been easy for me. I like to be super organized, scheduled, and I don’t like change. 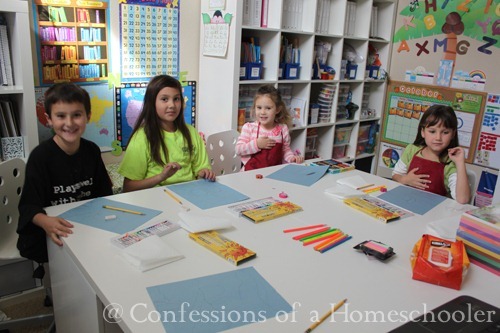 Apparently no one ever warned me that maybe homeschooling wasn’t a good fit for me! And frankly I’m thankful that they didn’t, or I wouldn’t have the opportunity to be with my kiddos everyday! As for teaching more than one student/grade level, it’s kind of a balancing act really, so I’m not sure I can give you a step by step answer. But I’ll do my best to explain our organized chaos. I try to do as much together as possible to save time and make teaching easier. 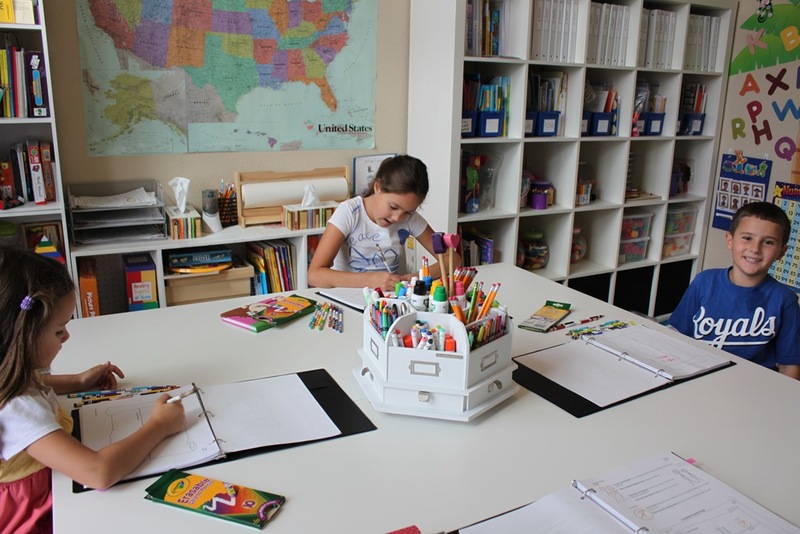 For us right now we do Daily Learning Notebooks, Bible, Science, History, Literature, Art, and Music as a group. It’s easier to teach one lesson with everyone obviously, and for the most part this works for more elective type subjects. We also do Calendar Time together, though it’s mostly Tinker Bell and the Teeny Tot doing it now. We also do math at the same time even though they’re working on different levels. I start off having my oldest watch her Math U See video, then she moves onto her worksheets, while Turbo watches his video. I have another computer at home, so Tinker Bell uses that and moves right to her worksheet. Then I stand by and supervise/help when needed. It’s basically the same format for the other subjects. For example, I’ll do English together with the older two teaching the lesson together then they do their own worksheets and while they’re working independently I do the phonics lesson with my 1st grader. If it’s something each one has to have an individual lesson on, I’ll usually do a lesson with one then start them on their work, then move to the next for their lesson, then the next. And our day progresses like this as we go, alternating between me teaching and them working. You really get more used to alternating between them as each year comes. The kids will also learn to work a little more independently as well. Next we have lunch and a little bit of free playtime, outside weather permitting! Finally, we meet back up for about an hour of history, science,music, and/or art depending on the day. I save our “fun” stuff for afternoons. We get back together after lunch and that’s usually around 1:00 pm. I chose to do science and art things in the afternoons so I’m not stressed out and rushing them through an art project or science experiment. And yes…I get tired and don’t feel like doing our afternoon school, but I do it anyway. Because my children’s education is important and it’s my job. How long does school take? A full school day currently takes us about 4 hours for the older kids (3rd & 4th grades), about 3 hours for my 1st grader, and about an hour to an hour and a half for the Teeny Tot’s preschool. Since she finishes earlier than the others, Tinker Bell usually plays with the Teeny Tot while I finish with the older ones. Click here to see a more detailed account of our daily schedule. Most of you know I’ve used the workbox system for the past several years. And I have to say that it has been a LIFE SAVER! It seriously helps me stay organized during our day. The boxes allow the older kids to go through their boxes independently for the most part except ones that need me to teach an actual lesson. It also helps because I can tell them to move on to another box until I’m done helping a sibling. And it is easy to tell how much more work we have left, and when we are done. It’s also easier for me to see if someone skipped something, or didn’t do a lesson. I would love to say that my children were perfectly obedient all the time, but that just isn’t true. That said, we did have to put some basic discipline tactics in place. Our main issue is keeping everyone focused on their work. Since we do most subjects together it can be a problem if someone isn’t working diligently. So in our home, if kids aren’t paying attention, or messing around when they should be working, then they have to put their unfinished work in a ‘homework’ pile to be completed at the end of the day. That way their poor choices aren’t affecting the rest of us, and we can all move on to our next subject and stay on schedule. I have to say that my kids have quickly learned it pays to get your work done without dawdling! Honestly, they don’t do that too many times before they realize it’s no fun to still be doing work when the other siblings are off playing! As for keeping people focused, I think they’ve just kind of learned to tune each other out. It was very difficult for Turbo to start off, so I used to give him my husband’s shooting ear muffs to block out the noise! I wrote about it in a post called Ear Protection for Peace! 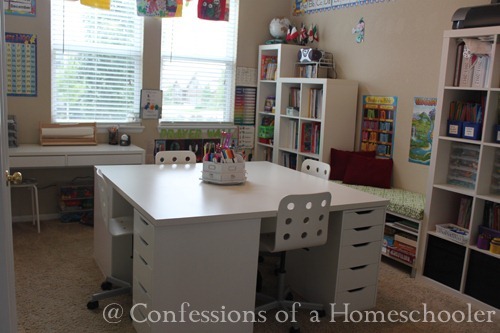 I also make sure that I’m doing my job by being present in our homeschool area, available for questions, or also there to keep people on task. I remind them to keep working if they’re messing around, or in Turbo’s case, I just need to be there to actually keep him in the room. He’s one of those that will sneak out the second someone isn’t looking! For whining and complaining, I think that goes away with time. When we started out, there was quite a bit of whining…”how much more work?” “Can I be done now” etc. Honestly the workbox system really helped out in that area. There’s no question now of how much work there is, how much is left, or when they can be done. They can literally see what they have to do and so that has been a life saver. We did however make a rule that there would be no whining in class. I have their initials up on my white board, and they receive a check for each time they complain. if they hit 3 checks, then they get to have a personal meeting with Principal Daddy to explain why they had a bad attitude that day. 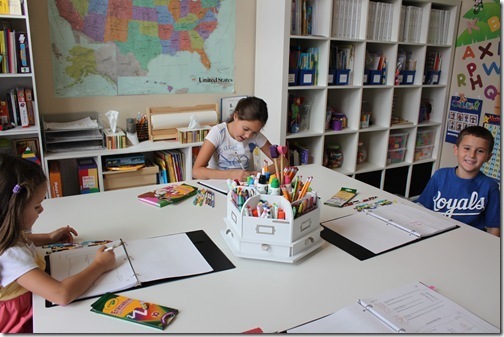 They also meet with Daddy if they have homework as well to explain why they were messing around instead of doing their work diligently. I have to say that after one meeting with Daddy, they don’t usually choose to complain or mess around in class too many more times after that! The kiddos also know that if they finish their work they’re free to go play, so that in itself is great motivation! So there you have it…my secret…LOL! But seriously, that’s how we are currently running things at the Confessions home. It is subject to change…based on my mood…the weather…a good exhibit at our local museum…and any other extenuating circumstances. Have some homeschooling, scheduling, or organizing tips to share? Leave a comment below! Blessings to you! Keep up the good work! I’m homechooling 7 from 1yo to 6th grader (with #8 due this summer). Much of what you do sounds similar to us. I thought I would share two things we do a little different for more ideas. First, we use MUS too and I never teach two lessons with the dvd in one day. What I’ve done is stagger the “new” lesson for each level to a different day of the week. That means I don’t have a long Monday where every single child has to wait on me for math. Instead one child has to wait on me Monday while another is doing a worksheet and a third may be doing their test. The next day the child who took a test gets a new lesson, but all the other kids are working on worksheets or tests and don’t need me. Second, assignment sheets are our way to let the kids see what they have to do in a day. They check it off as they do things and are free when they’re done. Thank you for this post. I’m a beginning Homeschool Mom and you have answered questions I have in my mind about how to work with kids at different levels (right now I just am doing preschool and thinking – how am I going to teach two a different levels next year HA) This is one of those times I wish I lived next door to someone like you so I could have that hands -on mentor – which makes me so thankful for posts like this . .. which I print and keep in my homeschool stuff so I can refer to it for ideas and for encouragement. Great ideas! Your blog really helps me! I enjoy and look forward to new posts on your site! I have wide age gaps between children, which has actually helped us, since the older one can usually work fairly independently. I admire how organized you are! How do you a) set up the boxes? Daily or weekly? and b) how do you figure out what and how much to put in there? I have read a lot about them but I am still a bit confused and, frankly, uncertain that I’d remember to refill them if the week became chaotic. So c) How do you remember? Hi! I have a post on organizing our workboxes coming up shortly! As a homeschooling mom to four ages 2 -7 I’m finding that as my youngest gets older it’s getting easier to school them all. She actually wants to participate in school and that has been extra helpful. Just since coming back from Christmas break we’re starting to find a good rhythm. I’m looking forward to the coming years of homeschooling as they all become a bit more independent too. It helps a LOT that my oldest can do about 80% of his work without me right next to him because my other ones are kindy and preschool ages and need me to be present for their lessons. We don’t have a dedicated school room either and my oldest really struggles with focusing on his school work when his siblings are doing something that he perceives to be more fun. I’ve been able to have him use my craft desk this week and that has helped a lot to have him in a separate space from us. Thanks for sharing how things work for you all! It gives me ideas and inspiration for next school year. My experience with that age was that it just comes with maturity. My oldest is in 2nd grade this year and I’ve even seen a HUGE improvement in his ability to work independently since the start of the school year to now. At the kindergarten and 1st grade level he very much needed that interaction to talk things out. It was frustrating because I had three younger kids but I’m better equipped to deal with the ones now at that age because I know to expect it. Maybe just try one subject/worksheet that she can do alone. Or give her the worksheet, tell her to do as much as she can by herself and stay close by so that she knows she still has access to you when she needs you. Erica, You so inspire me with all your greats ideas, resources and encouraging tips!!! I have many favorite sites and I have to say COAH is at the top of my list. Thank you for all your time and dedication in helping all of us who are so blessed to homeschool our children!!! I absolutely am full of green-eyed envy over your learning space. I started the workboxes with the younger kids last year and I love them! I think it helps so much with keeping them busy and with just one more thing while I am in the middle of teaching my high-schooler. Thank you for the awesome suggestions.